Just in time for the holidays came a party last week for photographer Oberto Gili's new book Home Sweet Home, published by Rizzoli. 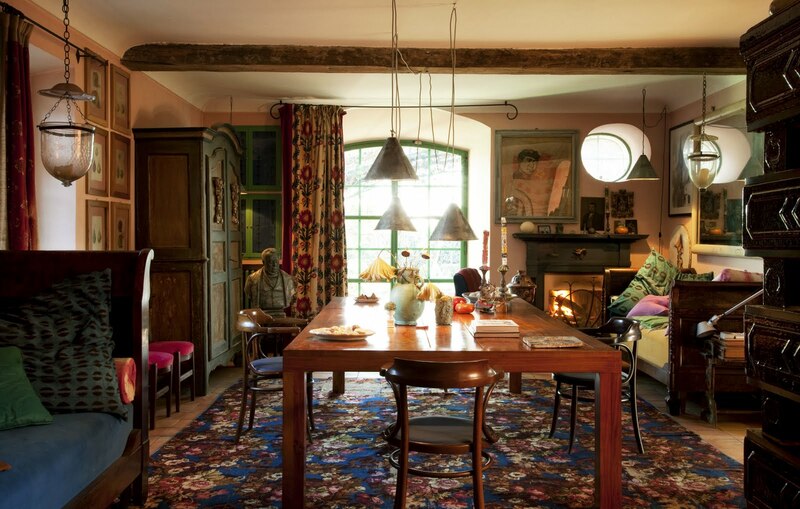 I hadn't met Oberto Gili before but was familiar with his evocative interiors photography published in magazines including the sadly now defunct Vogue Living. This book is subtitled Sumptuous and Bohemian Interiors, and it celebrates Gili's personal take on style. 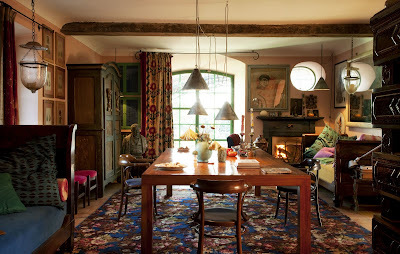 He writes in the book, "Decor serves as an expression of personality, fantasy, personal taste, culture and history." So the interiors photographed here are not designer showcases but instead signature homes created by people with great style. Speaking of. At the front door of the party I ran into my friend Mary Randolph Carter. 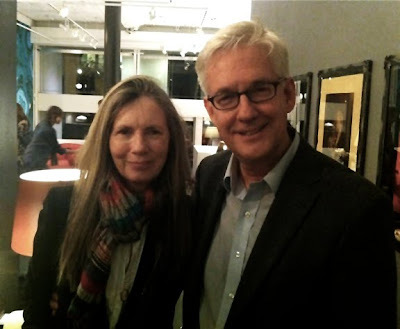 The party, held at the gallery of antiques dealer Liz O'Brien, was warm and welcoming on a cold and rainy night. Carter and I became friends when I worked at Polo Ralph Lauren and she was in charge of advertising there. 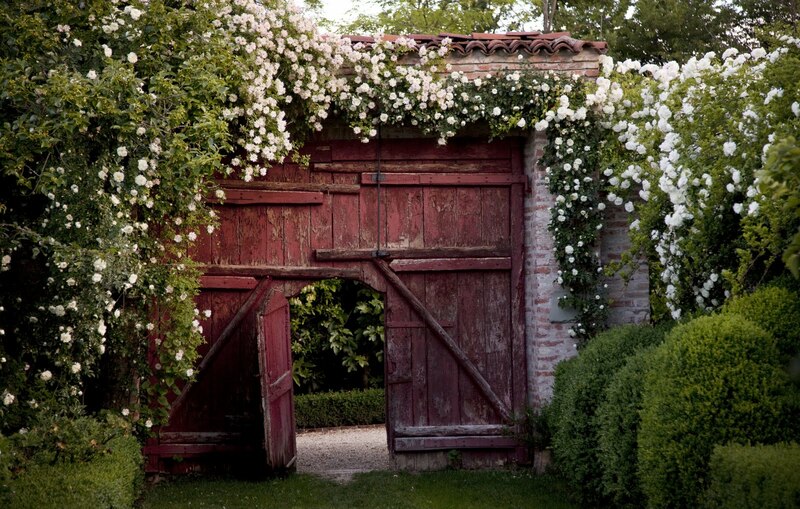 Now she works on Ralph Lauren advertising, books and collections, and has written several books herself, including the recent A Perfectly Kept House is the Sign of a Misspent Life, also published by Rizzoli. Carter's country-in-the-city approach to style has had a big influence on me. 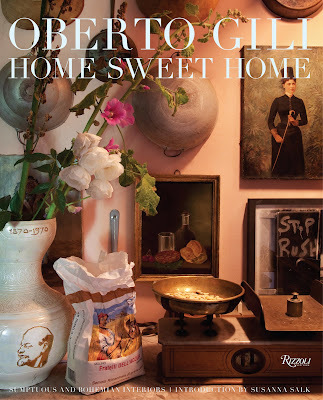 I had the pleasure of meeting Oberto Gili at the party and I asked him more about his book of interior photographs. He said, "The interiors are all quicky, intellectual, romantic." "Decoration is like fashion," he continued. "You can copy a fashion picture or you can mix and create your own style. In the same way you can hire a decorator and you will have a very pretty room but it is never yours. You want to feel a love of your place. Then it's a great success. Otherwise it's just showing off." 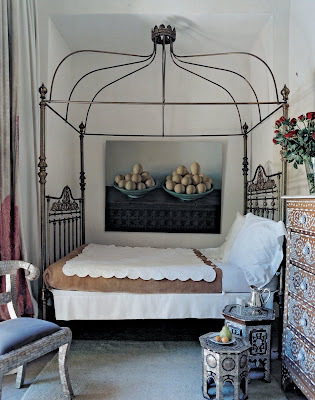 Here is the romantic, simple bedroom of Alvaro Bravo in Marrakech. 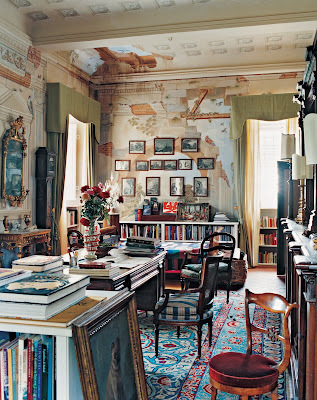 The library of Laura di Collobiano and Moreno Petrini in Tuscany. 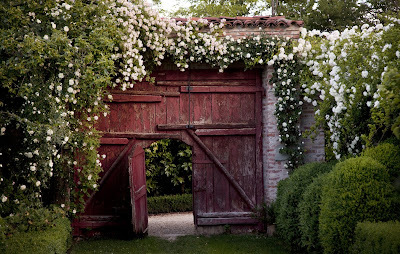 The last section of the book is devoted to Gili's own home in Piedmont, Italy. 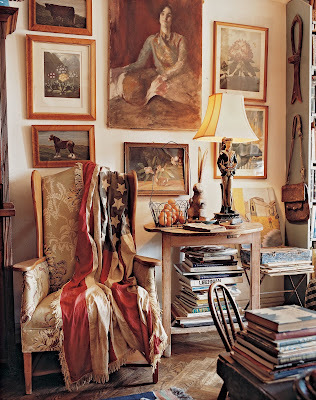 This cozy room has a mix of art and antiques and textiles, and a blazing fire. I love the industrial metal hanging lamp shades. Style continues outdoors into the garden. These are timeless settings that don't go out of fashion. This book inspires the reader to mix all different kinds of things together that he or she loves, and it attests to the power of the individual to create something personal and unique. Wonderful photos of many personal homes, I would have love to have that book. Looks like a great book. Thanks for the insight. This looks like another beautiful book to add to my ever growing collection...thrilled to find and follow your blog! !